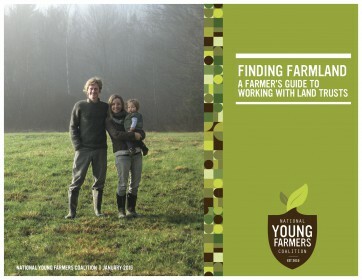 The National Young Farmers Coalition released a new guide for farmers, designed to provide an introduction to land trusts and explain the process of partnering with a land trust to access affordable farmland. The Farmer’s Guide to Working with Land Trusts is written for farmers, land trust staff, and farmer service providers. The guide gives an introduction to land trusts, explains how these groups can be powerful partners in a farmer’s search for affordable farmland, and provides detailed information about the process of working with a land trust. Finding and securing land to farm is one of the biggest challenges that beginning farmers and ranchers face in starting a career in agriculture. Farmland prices are at a record high across the country and land has become increasingly unaffordable for farmers. The land surrounding our nation’s cities, where market opportunities are greatest for beginning farmers, is often the most difficult to access. In the fall of 2013, we published Farmland Conservation 2.0: How Land Trusts Can Protect America’s Working Farms. In that report, we called on land trusts to increase their efforts to ensure that America’s farmland stays in active agricultural production and in the hands of farmers. We believe that farmers must be a part of this conversation as well. This guidebook provides farmers with practical tools and resources for partnering with a land trust to access land. Download the report here. Email holly@youngfarmers.org with questions!